I think there may be more link posts here. Or something where I just share. I want to include evergreen content, but I feel like if I don’t cover things in real time, then I forget a lot. You’ve been warned. This past weekend we picked off two on our To Do in Rome List. On Saturday we toured the Savoia bunker at Villa Ada. It was pretty neat to see and to learn more about a park where I spend a lot of time. New #housegoals to have a Travertine spiral escape staircase in my bunker. 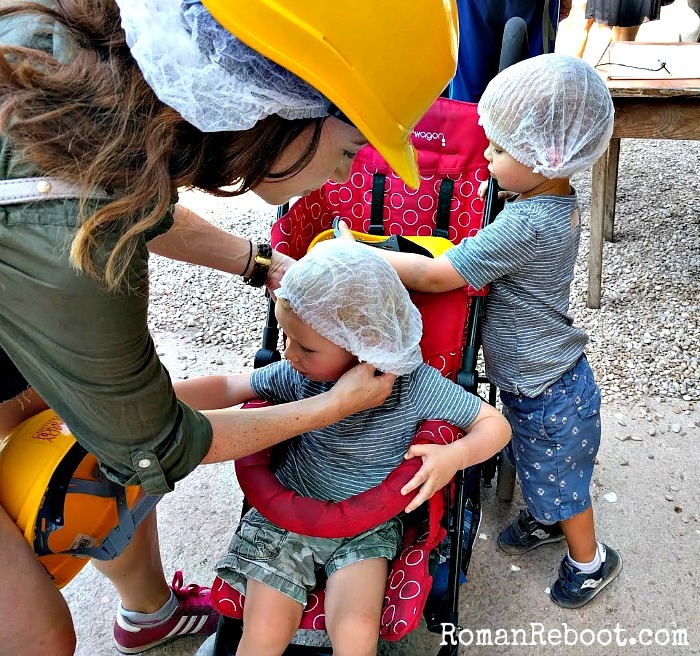 On Sunday we hit the Domus Aurea tour. This one was with the kids. That was . . . interesting. On the plus side, you can actually roll your stroller through the whole thing. (One staircase to exit.) On the other side, the tour was billed as being an hour and 15 minutes. It was definitely more like an hour and forty. We got hard hats. (With hair nets.) Yay! But the kids wanted those off after about two minutes. The guide was really hard to hear, and she kept insisting on talking while walking. No one could hear that. But she didn’t say anything when the kids ditched their hard hats or when we busted out lollipops. It was a very cool space to see–literally felt like AC in there–but maybe without the kids would be better. Oh, well. This weekend we are heading to Abruzzo. I think Sulmona and Pescara are on the list. Would love any recommendations! For future travel plans, I’m now gung ho about planning a Slovenia/Croatia road trip for this fall. I’m thinking drive there and ferry back. Possibly hitting this on the way because it just looks too cool. Things have been fairly quiet around here. Rome is definitely clearing out. And hot. Henry’s last day of school was last Friday. We’re slowly getting used to our new schedule. I finished The Hunt for Red October. Diving into The Cardinal of the Kremlin. The Summer of Clancy continues. You should go to Lake Garda. One of my favorite things in Italy yet. I’ve been drinking bulletproof coffee for a bit. Bulletproof intermittent fasting could be next? We’ve all heard of Myers Briggs, but I finally got around to taking my Enneagram. What’s your number? I’m still using PicMonkey for photo editing, but playing around with Be Funky these days. Anyone tried it? It seems to have different features, but I found it to be a lot slower than PicMonkey. 7800 pages of Clancy . . . in one summer?